Note: August 2007 was when the new gig guide was set up, and from hereon the archive is much more complete - but still may have gaps in it. Friday 1st June 2007 - Cider Festival & The Wurzels at Bath Racecourse, Lansdown, Bath BA1 9BU (01225 424609) First race 6.20pm, last race 9.00pm, an evening of 'orses & Zider, details here. Friday 15 June 2007 - The Wurzels and Hogwash at Teign Valley Community Hall, Christow. Admission only by advance ticket £15, available from Christow Post Office. In aid of Community Hall funds. Saturday 28 July 2007 - The Wurzels at Plymouth Beer Festival 2007 at Main Arena, Plymouth Pavilions, Millbay Road, Plymouth, PL1 3LF. Alongside the 140+ ales will be (approximately) 35 ciders and 5 perries, from the South West and further afield. Noon - 11pm. Entry £4 (free to CAMRA members) before 6pm Saturday. 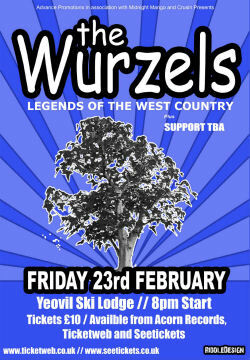 After 6pm, The Wurzels, entry £7. Souvenir glass & programme £1.50. General enquiries 01752 222200. 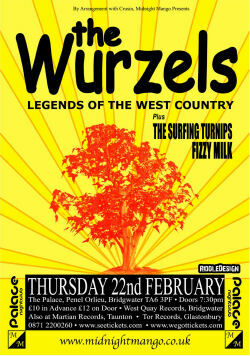 Note: The Wurzels cancelled this appearance! Wednesday 8th August 2007 (8pm) - The Wurzels and Mr Tony Beard at Princess Pavilion, Melvill Road, Falmouth TR11 4AR (01326 211222) Tickets £12.00; see venue website for outlets. Sunday 19th August 2007 - The Wurzels at The 155th Mid-Somerset Show, Shepton Mallet Showground, Cannard's Grave Road, Shepton Mallet BA4 4LY Entry free; parking £7.00 per car. 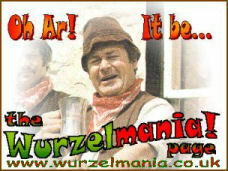 The Wurzels will be performing two sets at 12:45pm and 5pm. Friday 24th August 2007 (8pm) - The Wurzels and DJ Steve Carpenter (Ivel FM) at Beer & Cider Festival at Talbot Arms, Benville Lane, Benville, Evershot, Dorset (01935 83381) - Hog Roast & Barbeque with all proceeds to Dorset & Somerset Air Ambulance. Tickets �10.00 - available from The Talbot Arms or Bob's Tyres in Crewkerne. Sunday 26th August 2007 (5pm) - Chas 'n' Dave, The Wurzels, The Hamsters, John Otway, Pinstripe, Helena & Tom Palmer at the Midsomer Norton Music Festival at Midsomer Norton Cricket Club, Withies Lane, Midsomer Norton BA3 2JE (07806 533172) Tickets �10.00; under 11's free, if accompanied by an adult. Tickets available from MNCC Bar, or Peformance Sports in Midsomer Norton High Street. Credit Card bookings hotline: 07806 53317. Tuesday 18th September 2007 (8.30pm) - The Wurzels and John Otway at St Ives Festival at The Guildhall, Street-an-Pol, St Ives, Cornwall TR26 2DS (01736 366077) Tickets £15.00 in advance. Friday 28th September 2007 (8pm) - The Wurzels at Masqueraders Carnival Club Fundraiser at Glastonbury Town Hall, Magdelene Street, Glastonbury BA6 9EL. Fully licensed bar with Heck's Cider Bar. Tickets £10 in advance and £12 on the door. Tickets available from Whiteheads Newsagents, High St, Glastonbury and The Twilight Zone, Benedict Street, Glastonbury. Information line: 07866 663793. Saturday 29th September 2007 - The Wurzels and The Glambusters at Charity Night at The Scotch Horn Lesiure Centre, Brockway, Nailsea BS48 1BZ (01275 856965) Charity night in aid of PPUK; tickets £15.00 including buffet. Thursday 29th November 2007 (8pm) - The Wurzels with Chas 'n' Dave at Westland Leisure Complex, Westbourne Close, Yeovil BA20 2DD (01935 848380) Tickets £12.50 in advance.